Howard Henderson, Professor of Justice Administration and Director of the Center for Justice Research at Texas Southern University, is an expert in race and ethnicity, prisons and jails, probation and parole, community and program development and mass incarceration. Henderson has consulted with several organizations, including the Bureau of Justice Assistance and the Mental Health Jail Diversion Program, Baylor College of Medicine’s Initiative on Neuroscience and Law, and the Texas Department of Criminal Justice Multidisciplinary Board, where he was a member of the U.S. Department of Justice and Department of Labor’s Prison Reentry Initiative. Currently, Henderson serves as the Chair of the Houston Racial/Ethnic Disparities Committee Data Workgroup funded by the MacArthur Foundation. Henderson has been published in numerous journals, including the Journal of Criminal Justice, Policy, Practice & Research, and Sociology of Race & Ethnicity. 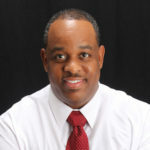 Henderson received his Ph.D. in Criminal Justice from Sam Houston State University, M.C.J. from Tennessee State University, and B.S. in Criminal Justice from Middle Tennessee State University.